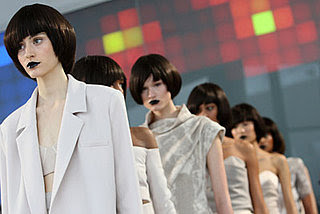 Stepping out of the box, Bobbi Brown creates a gothic lip for the Rachel Roy - Fall '09 runway. 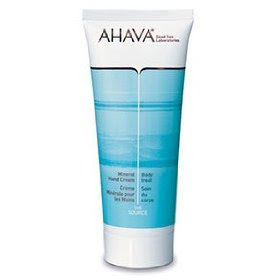 Ahava is an Israelian company that prides themselves in using Dead Sea minerals in all of their skin care products. Minerals of all kinds are carried by the waters of the Middle East and deposited at the bottom of the Dead Sea and are said to do wonders for your skin. Magnesium, potassium, and calcium are known as Natural Moisturizing Factors (NMF). These minerals attract moisture and retain it. Translation - great ingredients to help our skin stay firm and hydrated. Yesterday I got a sample of their Mineral Hand Cream. It's a rich cream with tons of the NMF stuff. It left my hands smooth and soft with no greasy feel with a fresh, clean, spa scent. Luv it! February is National Heart Month. Did you know that Heart Disease is the #1 killer of women? One in four women will die from this disease. To raise awareness, Pretty City has partnered with The Heart Truth, a campaign for women about the disease, to offer $59 beauty services at participating spas & salons. Take care or yourself and your heart by visiting your doctor annually for checkups! Click here for participating spas/salons.